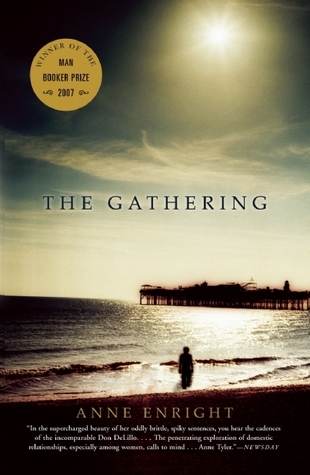 Book Review: The Gathering by Anne Enright - Book.Blog.Bake. I took some time from my recent bout of YA to read some literary fiction set in Ireland. I was really excited to read this book, because of the setting and the idea of, as the summary says, “betrayal of redemption through three generations”. Literary fiction and classics are what I read most in the past few years before I rediscovered how wonder YA could be, so I thought it would be a nice book between action-packed Dystopian adventures. Unfortunately, The Gathering didn’t really do it for me. The Irish setting of the book was played up a lot on the cover and in some of the endorsements on the back of the book, but the Hegartys didn’t seem to embody the “Irish family” as claimed. Now, to be fair, I don’t exactly have a whole lot of knowledge in the subject, but I do feel like you could have taken out the heritage of the Hegartys and have the exact same story. There were two aspects of this book I really enjoyed, and the book ends up with a star for each. The first is the way Anne Enright writes memories. The narrator in this book will describe a memory she has, and then admit that she knows the memory can’t have happened the way she thought it did because of some detail she remembers. This is how memories work in real life–I’m sure we all have memories we can recall with absolute certainty, only to remember things couldn’t have actually happened that way because we remember other circumstances surrounding the event, yet in our minds that memory remains firmly in place. That can be quite a frustrating experience, to feel you’re right about something when the facts you yourself remember contradict you, and I felt that throughout the course of this book. The first half of this book is composed mainly of memories, and for the first fifty pages, I was firmly hooked on this story for that simple fact alone. The second aspect that I enjoyed was the writing itself. Each sentence was like a poem in and of itself. Even at moments in the book when terrible things were happening, the way each sentence was written was nothing short of beautiful. It’s the kind of writing that just begs to be made into an audio book to fall asleep to. Unfortunately, the rest of the book fell short for me. Many of the memories that the narrator recalls seems to have no actual significance for her family or the plot of the book. It takes an entire half of the book to get to the point where you can even begin to realize what the story is about, and by that point I was already lost. Nothing seems to get resolved from that point on, and instead the narrator just keeps plodding along. This is the epitome of a two star book for me. It’s certainly not terrible, but it’s not really close to reaching an enjoyable level either. Two star reviews are my least favorite to write and is the rating I give out the least frequently, but The Gathering is definitely one for me. Final Impression: The writing in this book is gorgeous and at times haunting, but it doesn’t really stand on anything else. It takes too long for the “big reveal” moment to actually happen, and by that time I didn’t really have quite the level of emotional attachment to the Hegarty family as I would have liked. 2/5 stars. I tried this book before and hated it. It was a DNF for me and I felt so disappointed as I had high expectations for it. Yeah, the summary made it sound so great, but it was just mainly pages of a meandering narrator.